Entry fee is £6 or just £3 for subscribers. If your story is placed you will be notified and we will ask you to send a photo of yourself and a brief biography via email. 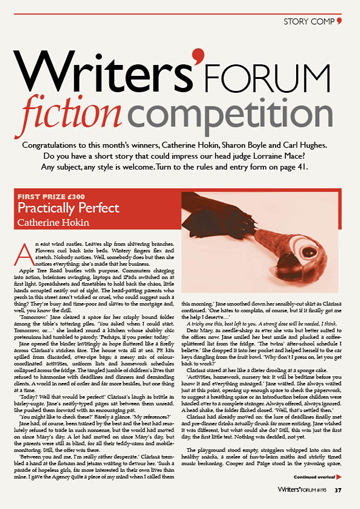 Our judge Lorraine Mace can provide a page of personalised critique to help you improve your writing. The fee is just £5. You will receive feedback by email if you enter online or please include a stamped addressed envelope if you are entering by post. Each month Sue Moorcroft selects illustrative examples to use in her workshop to show readers how to improve their writing. If you would like your story to be considered, please state this clearly in your email entry. See the magazine for a postal entry form or download one (as a pdf) here. Please include a stamped postcard if you require proof of receipt. This is a rolling competition which means that entries received after one issue's cut-off point are simply placed in the next contest.